The term ‘fairytale’ gets thrown around a lot when it comes to Europe’s countless castles, but these fantastic fortifications and wondrous palaces are sure to add some magic to your next holiday. The alpha and omega of ‘fairytale’ castles, the whimsical towers of Neuschwanstein were the real-life inspiration behind the Walt Disney Castle, Cinderella’s castle in the Magic Kingdom, Sleeping Beauty’s castle in Disneyland, and countless other magical castles. Designed by a theatrical set designer in homage to Richard Wagner, Neuschwanstein utilized cutting-edge 19th-century technology, such as indoor plumbing and electricity. Beautiful views, decadent interiors, and even an artificial cave make Neuschwanstein Castle a must-see when travelling from Munich to Ischgl. Built over the course of several centuries, the UNESCO-listed Prague Castle is the largest medieval castle in the world according to the Guiness Book of Records. This sprawling complex is essentially a self-contained town for royalty, with courtyards, gardens, cobbled alleyways, several palaces, and even a Gothic Cathedral for visitors to admire. A great way to double up on Old-World wonders is a trip from Vienna to Prague, where you can enjoy the heart of Europe and its magnificent castle. Built in 1664, the Nymphenburg Palace in Munich served as the summer residence for five Bavarian monarchs. Today, this beautiful Baroque building offers visitors an exquisite combination of art, architecture, and manicured landscapes. The palace interior is filled with beautiful artwork and furnishings, and is particularly renowned for its jaw-dropping Rococo decorations. The surrounding park is filled with serene walking trails, and even houses one of Germany’s finest botanical gardens. This lavish landmark is a decadent ending for a magical car trip from Prague to Munich, which also gives you the opportunity to stop at the stupendous Karlstejn Castle (see below), meaning you can experience 3 of Europe’s most magnificent castles in one easy trip! Built in 1348 by Charles IV, the Czech Republic’s most beloved king, this large Gothic castle is both an architectural and cultural treasure, which was used to safeguard the royal treasury, holy relics, and most importantly, the crown jewels of the Holy Roman Empire. Karlstejn Castle, with its historic architecture, royal interiors, and stupendous views, is a favourite side trip for travellers on the road from Munich to Prague. The first German castle to be named a UNESCO World Heritage Site, Wartburg Castle is one of the best preserved medieval castles in the country. Along with stupendous views, historic architecture, and some dazzling decorations, the castle is famed as having been home to Martin Luther after he was excommunicated – visitors can even take a peek into his private study. A trip from bustling Berlin to fantastic Frankfurt is the perfect opportunity to stop to see this fantastic fortification. Built in 1699, the UNESCO-listed Schonbrunn Palace is the largest and most visited palace in all of Austria. With 1,441 rooms and 120 acres of land, visitors can enjoy museums, sculptures, a garden maze, and even a zoo at this Baroque behemoth. After enjoying the Austrian capital’s many charms, Schonbrunn Palace is a most decadent distraction for a captivating road trip from aristocratic Vienna to Budapest and its UNESCO-listed Old Town. Founded in the 13th century, Ksiaz Castle is one of the largest castles in Europe. Combining Gothic and Baroque architecture, and a slew of interior styles, the castle is best known for being the seat of the Nazi High Command, who dug over 2 kilometers of tunnels beneath it. The stupendous views, historic architecture, and richly decorated interiors make Ksiaz Castle engrossing stop while travelling from Prague to the incredible island-spanning city of Wroclaw. 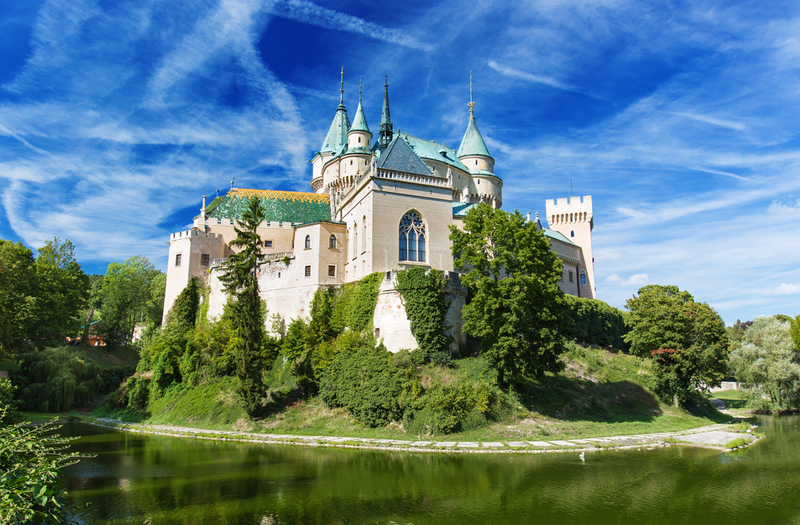 Styled after the romantic castles of France’s Loire Valley, Bojnice Castle is without a doubt one of the most beautiful (not to mention the most popular) sights in Slovakia. The castle’s dramatic towers rising above the beautiful natural surroundings paired with an exceptional collection of historic artwork and furnishings make a visit to Bojnice a no-brainer when you’re making the trip from Bratislava to the chilling Auschwitz-Birkenau. Built by the Teutonic Knights in the 13th and 14th centuries, the UNESCO-listed Malbork Castle is the largest brick fortification in Europe. Fully restored, the sprawling grounds span three sections, making it a perfect place for history lovers to explore. Along with the commanding architecture, the castle houses its own Medieval museum and an exceptional amber museum. This commanding center of Medieval history is a is a fascinating stopping point when travelling from Poland’s capital of Warsaw to the unique port city of Gdansk. Sitting atop a rocky outcrop, and surrounded by soaring alpine peaks, the 900-year-old Hohenwerfen Castle sure paints an impressive picture. Featured in the classic WWII film “Where Eagles Dare”, Hohenwerfen keeps history alive through its many attractions, including medieval shops, a castle tavern, an extensive weaponry exhibition, and even a falconry show. 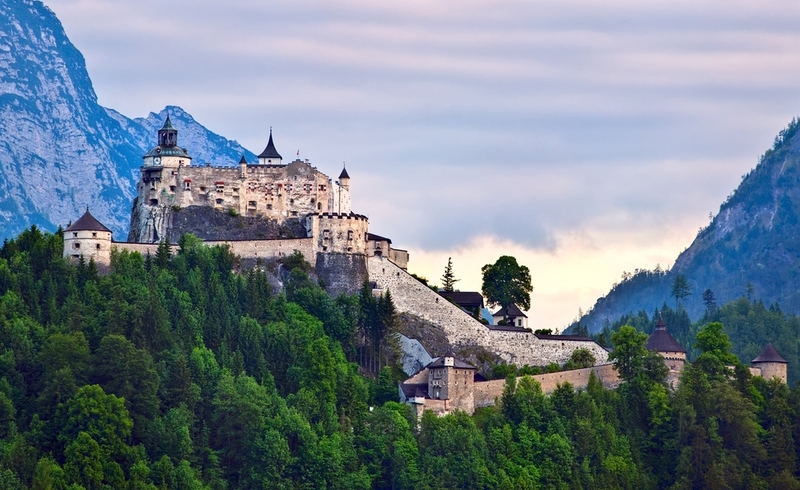 Hohenwerfen Castle makes for an immersive stop for travellers en route from alpine Salzburg to aquatic Venice. 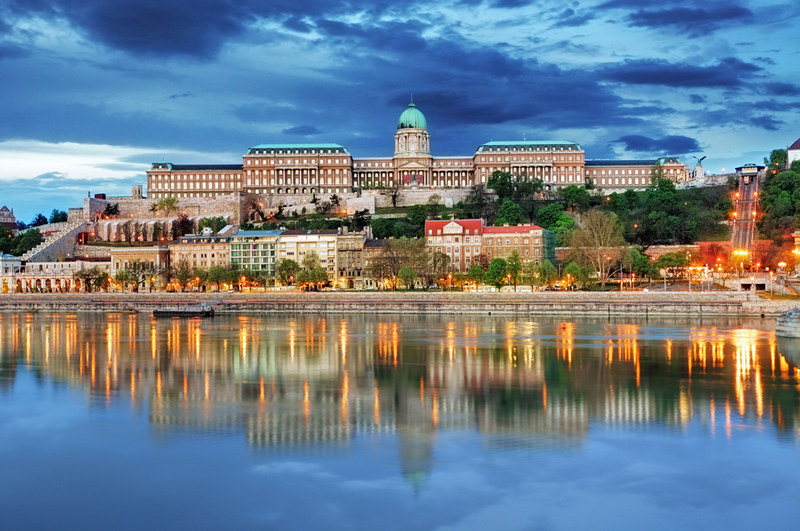 Last, but certainly not least, is the UNESCO-listed Buda Castle in Hungary’s capital of Budapest. Watching over the capital from atop the aptly named ‘Castle Hill’, the massive Baroque palace was built in the 18th century to replace an older castle. A commanding sight from a distance, up close, the castle’s grounds offer visitors countless statues, fountains, and architectural curiosities, not to mention a stupendous view across the Danube to the other side of the city, while the palace interior now houses the National Gallery and National History Museum. This magnificent complex is just one part of Budapest’s UNESCO-listed Old Town, and a great reason to arrange a trip from Vienna to Budapest. Which castles have you been to? Are any on your bucket list? Let us know in the comments below!